Marilyn Scott-Waters of TheToyMaker.com has a goal to help grownups and kids spend time together making things, and these paper toys are their gift to you. 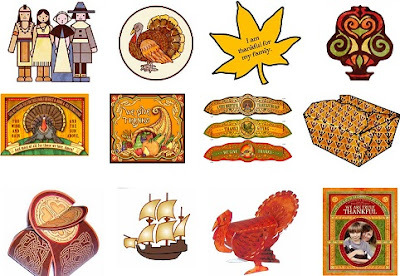 For Thanksgiving she has several free papercrafts for you, such as napkin rings, stand-up turkey, place cards, photo card, bonbon box and so much more! • Turkey Hunt - Hide these little dots all over the house and play hide and seek. Or Print them as stickers. • Leaves to colour - Colour these leaves to decorate your table. • Fall Comfit Box - Fill this box with candies almonds or maple sugar candies to give to a friend. • Thanksgiving Photo Card - Use your own photo or drawing to complete this card. Marilyn Scott-Waters is the creator of a paper toy craft book series The Toymaker's Christmas: Paper Toys You Can Make Yourself, and The Toymaker’s Workshop: Paper Toys You Can Make Yourself. She is also the co-creator with J. H. Everett of the fully illustrated middle grade nonfiction series, Haunted Histories, illustrated The Search For Vile Things, and created paper engineering for Pop and Sniff Fruit.